Duplex offices for rent are available in the heart of Manama city centre, offering unparalleled view of the sea and the city. 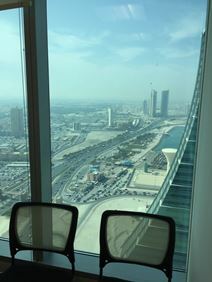 The office is housed within a modern building which has the distinction of being Bahrain's tallest building. The largest shopping plaza in the city, Seef Mall, is just across the road whereas the international airport is 11 km away. The office also offers secured parking spaces and 24-hour CCTV monitoring for all your business comforts. Offering 360 degree panoramas overlooking the Bahrain Bay, this spectacular tower, renowned for its impressive twisting structure, provides a range of flexible workspace options from virtual offices and co-working areas to fully furnished and equipped private offices. It also has an excellent selection of services, such as reception staff and telecom services to help you stay connected. Surrounded by various shopping outlets and restaurants, it is easily accessible by a number of public transport links. 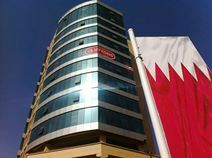 This business centre occupies a city centre location in an iconic landmark building in Bahrain. Offering superb serviced offices in a comfortable and efficient environment, ready for your business. It is the country’s first ‘intelligent’ building with integrated SMART IT systems. Thirty-four storeys of this 50-floor building are home to high specification office space and the business centre is reached through an impressive double-height lobby. Easy to access form the King Faisal Highway and the International airport. Benefiting from modern, chic interior design and a prestigious business address, these offices are visible from almost every point in Manama and sit on the 34th floor. Businesses can benefit from the comfort of air-conditioning, supreme administrative support, 24-hour access and CCTV security. Just off the King Faisal Highway, your company will provided with plenty of on-site parking and excellent transport links to take you in and around the city. These office suites are distinctively catered for the technology-savvy business travellers. Dedicated broadband access, VOIP communication systems, remote portal access, online meeting tools, data storage and customized printing are all provided as standard. The building itself embodies a modern and sophisticated look, a notable presence in the northern seashore of Bahrain. Minutes’ from the Bahrain International Airport and close to major city roads. An outstanding selection of fully furnished offices is available to let in this spectacular building just off the King Faisal Highway, recently built in the business district of Manama and close to government and diplomatic offices. Boasting an attractive interior and technologically equipped, these offices benefit from a stunning view over the sea and the city whilst benefiting from local services. It is also 10-15 minutes away from the airport with a hotel and spa within walking distance. Offering stylish furnished offices in a range of sizes that overlook the Arabian Gulf, this business centre is located in the central business district of Manama. It has great access to public transport connection, with Bahrain International Airport just 15 minutes away. There are lots of landmarks in the area to explore, in addition to an excellent selection of cafes to take advantage of during well-deserved breaks. With stylish furnished offices this business centre is located in the central business district of Manama, just off the King Faisal Highway. It has excellent access to public transport connection, with Bahrain International Airport just 15 minutes away. There are lots of landmarks in the area to explore, in addition to an excellent selection of cafes to take advantage of during well-deserved breaks. Strategically located in downtown Manama, the business centre is a real gem for enterprising businesses and investors alike. Chic interior designs are further enhanced by ergonomic furniture throughout the centre. Facilities such as video-conferencing and communication systems are readily available. Surrounded by exclusive neighbours such as Central Bank of Bahrain, Ministry of Finance, Ministry of Justice and Telecommunications Regulatory Authority. A prestigious business address in Bahrain that renders all the luxuries of a 5-star establishment. This centre offers offices with 32"" LCD TV with complete satellite subscription, conference rooms with 52"" LDC presentation screen, executive desks with exclusively-designed leather chairs, AVAYA wireless teleconference system and high-speed broadband access. A penthouse gym and rooftop swimming pool completes the impressive list of indulgences. Excellent location with only 2 minutes’ to the main highway which links directly to the international airport, other cities in Bahrain and also neighbouring countries. The lavish 5-star resort, The Ritz Carlton, is nearby as is numerous offices, restaurants, coffee shops and retail outlets. Only 5 kilometres from Bahrain International Airport, this centre provides fully furnished offices and virtual solutions from their home on the 11th floor of this Seef District tower. The centre also offers on-site administrative support in addition to 24 hour security. Perfectly located, the centre is at close quarters to many public services, such as Seef Mall, where you can enjoy a selection of restaurants, cafes and stores. Situated in Manama's Diplomatic Area, the city's financial district, these offices are on the 13th floor of one of Bahrain's most exclusive and advanced commercial complexes. Current tenants of the building include Ahli United bank and the ministry of Shura council & Representative Council Affairs.The building is surrounded by various local services, including dining options and cafes. It offers easy access to the Diplomatic Radisson hotel, so it is reachable for both local and international clients. This office space combines elegant design with superior business offerings. It offers both executive and virtual offices in a formal yet relaxed environment, all backed up by dedicated support staff on premise. 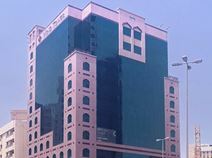 The office is located in the centre of Manama, Bahrain's well-known commercial district. The supreme location of the office also creates a platform to expand your business in Bahrain and other neighbouring countries. Situated in Manamas Diplomatic area, this centre is ideally located with good transport links from the fifth floor of a landmark 11-storey glass tower. 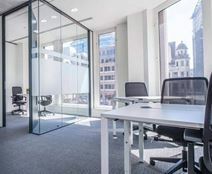 The building is surrounded by companies from oil and gas, tourism and banking, and is fully equipped with hot desks, IT support, air conditioning and on-site parking. Just 15 minutes away from Bahrain International Airport, the centre stands at close quarters to a selection of cafes, and is easily accessible from Rd 1708, just off the King Faisal Highway.